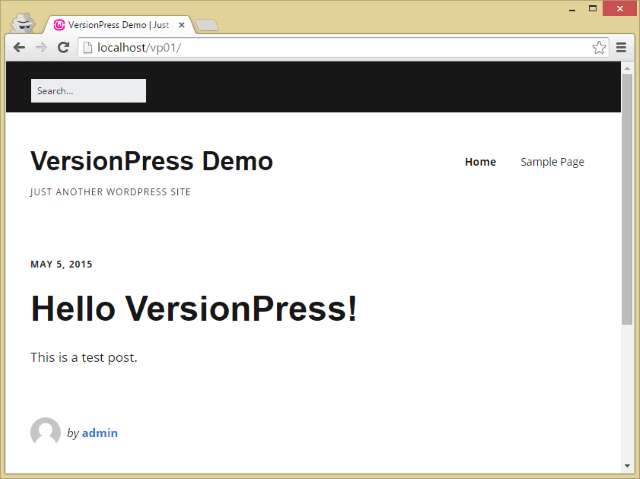 In this blog post I'm going to show how VersionPress 1.0 works and how it can help you manage your WordPress sites. It is a lot of screenshots so let's get rolling. 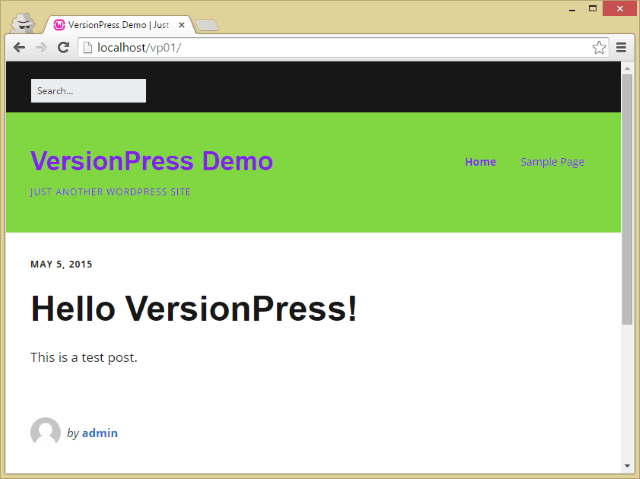 UPDATE: For new features in VersionPress 2.0, see this blog post. This creates the initial state (version) of a site and all is set. The user interface is currently quite basic (big improvements are coming in the 2.0 release) but you can already see how VersionPress captured all actions, and some more (those that WordPress does internally). This is valuable in itself (arguments with clients, “I definitely didn't do this”, anyone?) but it's not the best part. The best part are reverts. As you can notice, there are two links next to each action: Undo this and Roll back to this. Let's play with Undo first. 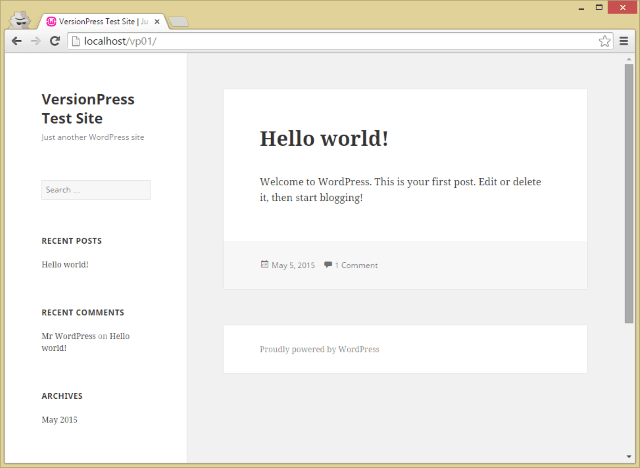 What is interesting to note here is that the updated blog name and the new content have been preserved. Let's pause here for a bit, this is important. What you just saw is very evidently a desirable feature to have, but technically so hard to implement that not many user-facing software solutions do that today. Just think of MS Word, for example. It's a sophisticated piece of software, being developed for more than 20 years, but when you format a paragraph and then edit a text in it, you cannot undo just the formatting – the reverts are always “all or nothing”. It's the same with many other pieces of software, from Apple's Time Machine, Google Docs to traditional WordPress backups. VersionPress can do selective undo which is a unique, yet very useful and intuitive feature to have. We're very happy to be able to offer it. Let's move on to rollbacks. Rollbacks take you to some previous state of a site, kind of like a traditional backup & restore but with certain benefits like that you don't need to decide on a backup period up-front (VersionPress creates new “backup” after every logical change), or that the “backups” are extremely space efficient. And it worked, the pre-rollback state is back! Little bit crazy, right? 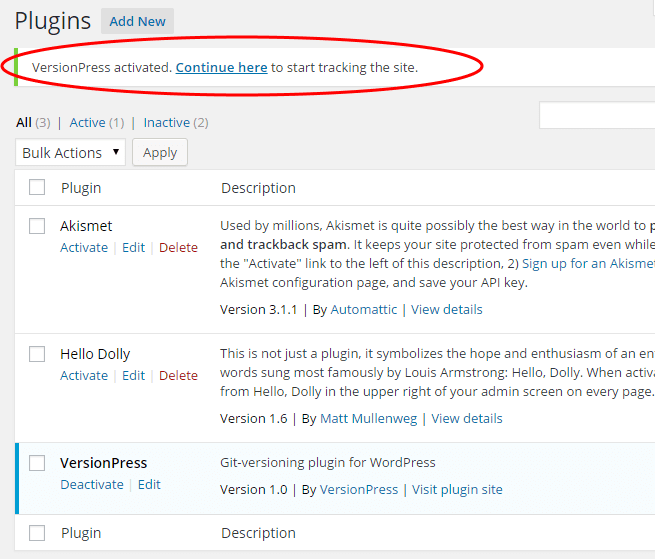 Now, you can do this with anything – plugin updates, WordPress core updates, adding or deleting users, really anything. 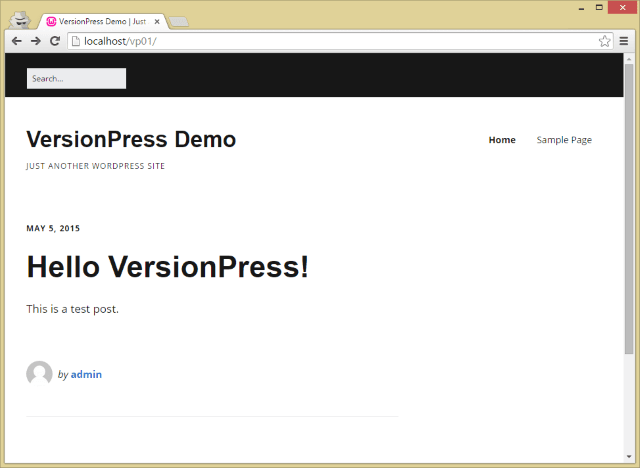 VersionPress is a perfect safety net which you basically set up once and then can forget. The technical beauty of VersionPress is that behind the scenes, we didn't actually implement a single line of versioning code ourselves. All the powerful features are powered by Git, the world's most popular distributed version control system. If you don't know what Git is, you can safely skip this section but if you do, carry on, this will show some important workflows. 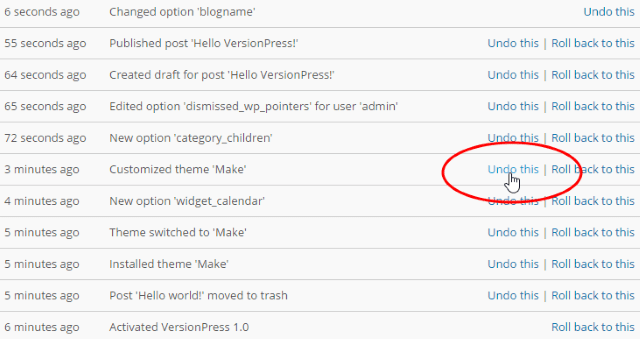 I can click the Undo button there as with any other change – VersionPress doesn't really care how the change was created, whether by auto-tracking or by hand, it's just one logical change of the site, period. 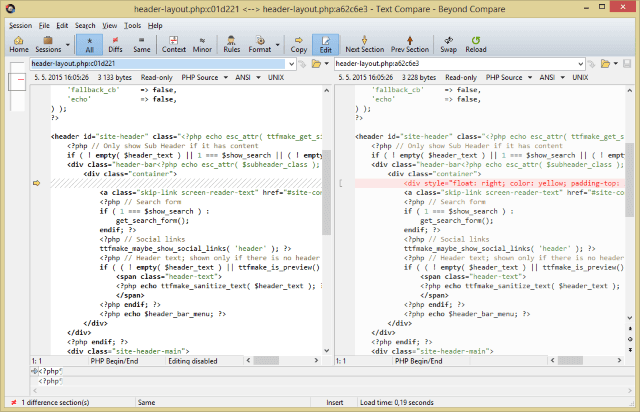 I can do branching / merging, I can push the repo to sites like GitHub or BitBucket, there are really no limits. For me, personally, this is extremely exciting because I always wanted something like this and VersionPress is finally a solution that is a simple Undo button from the outside but the ultimate versioning technology from the inside. 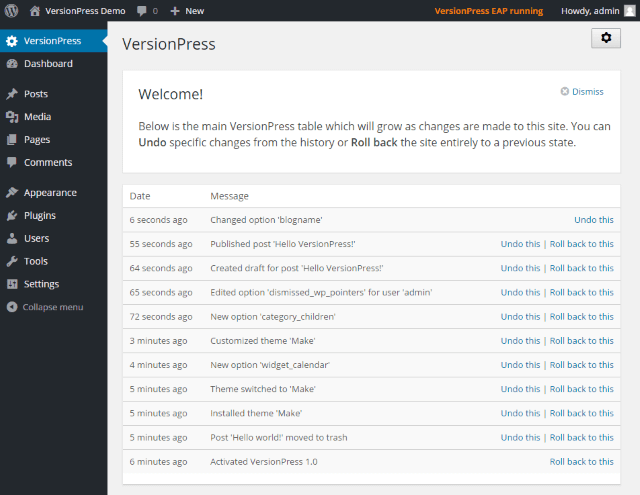 Hopefully you now have a good idea of how VersionPress works and what it brings to the table. 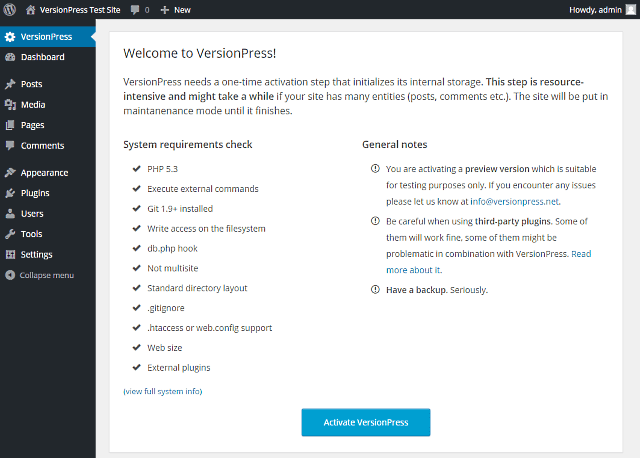 It's vital to repeat that VersionPress 1.0 is really just the beginning – there are a lot challenges ahead (shared hosting support, complex 3rd party plugins, etc.) but what we have in 1.0 is already quite unique and can do things that were hard to impossible before. We hope you like it, and if you do, you can follow the progress on Twitter or Facebook or join the EAP to support the project. Thanks!